The Coppell Student Section showers the field with confetti and the sound of cow bells as they cheer on the Coppell Cowboys at HEB Pennington Field on Sept. 1. Many Coppell Students dress up in funny costumes, such as dinosaurs, teletubbies and hotdogs, as the Cowboys defeated L.D. Bell, 58-23. Friday Night Lights in Coppell are nothing short of riveting to locals, students and teachers. 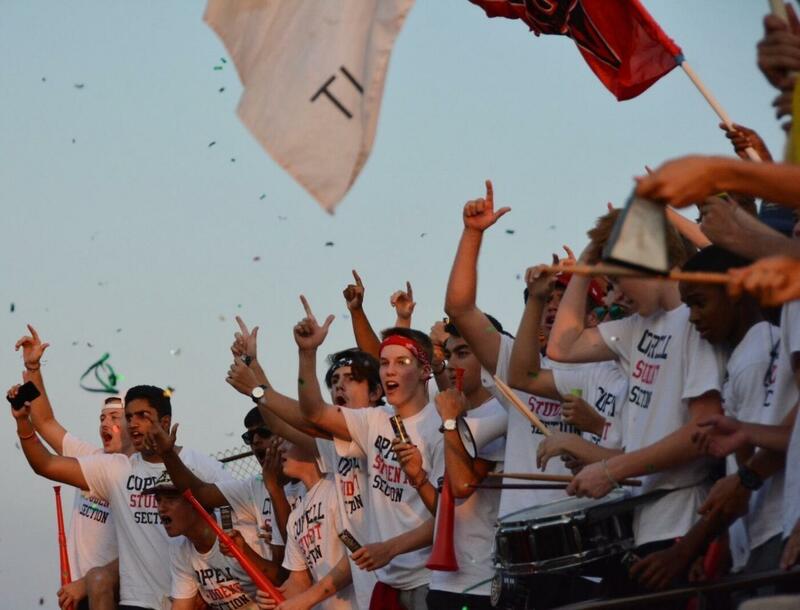 At every football, volleyball and basketball game, Coppell High School fans cheer for their favorite players from the stands to let them know that they are supported and appreciated in every touchdown, score and shot they make. The Student Section goes out to each game to cheer on its Cowboy counterparts by throwing their symbolic baby powder, banging their gong and tossing confetti amongst themselves. This week, the Student Section leaves the friendly confines of Buddy Echols Field and goes to Eagle Stadium as the Coppell varsity football team plays state-ranked Allen at 7:30 p.m. Friday. 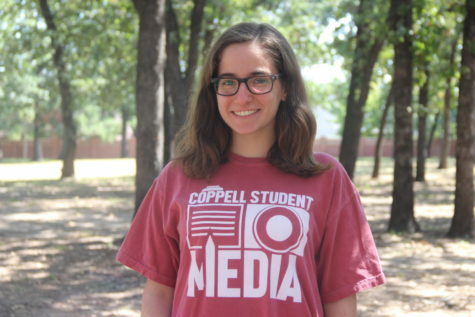 Although the Student Section was not always this integral to Coppell football, volleyball and basketball games, it has become much more popular over the years through its yearly T-shirt sales and social media platforms. “The T-shirt sales raise money for the student section so with that we’re allowed to buy the gong, noisemakers, bells, confetti baby powder, and all the things that make the student section really fun,” senior Callie Conner said. Being in the student section not only makes students feel good about supporting their friends, but also lets them spend time with their friends and get excited about what’s happening on the field. For senior cheer captain Mackenzie Dennis, being a cheerleader means more than just performing stunts and entertaining crowds. It means getting to experience football games in a different way than most people do and getting to do what she loves while doing it. This year’s Plunger Boy, Kevin Galvin, is in charge of ordering items for each upcoming football game. Although baby powder cannot be used at this week’s game in Allen, there are other plans in store to make sure the Student Section does not go unnoticed.